Have you ever wondered how some people seem to be so adept at learning languages? Recently there has been an explosion of polyglots (a funny word used to indicate someone who can accurately converse in at least four languages). Do you have dreams of being a polyglot, but have doubts about your ability to learn even one language? Have you tried popular language learning apps and programs like Duolingo or Rosetta Stone? Have you given up on learning a language? 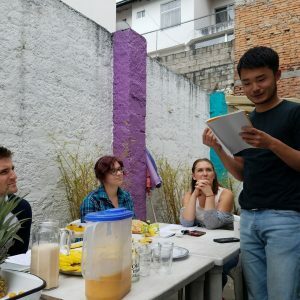 While it might be true that some people have more of an affinity towards language learning than others, at Vida Verde, we believe that anyone can learn Spanish as long as they have the right mindsets. Read on to learn about the three mindsets we believe are necessary to “dominar” Spanish. The path to a successful language learning journey starts with confidence in the language learning process (not necessarily confidence in your own ability to learn). Language learning theory states that grammar is hardwired into the human brain. In other words, the brain is designed to make meaning out of words and to understand grammatical concepts. It thirsts to understand what is being said around it. The theory posits that languages all have the same basic foundation. As humans, we are not born with a specific language preset, rather we are born with the ability to build on this foundation and to learn whatever language we are exposed to. You don´t have to be a phenome at learning languages in order to be bilingual. The ability is already present in your brain; you just have to access it. That’s why at Vida Verde, we believe that it is more accurate to say that you acquire a language as opposed to learn a language. This leads us to the question, but how do you access this innate ability to acquire a language? The best method of accessing your bilingual brain is through practice, practice, practice. The brain will begin to acquire grammatical structures and vocabulary over the course of being exposed to them many, many times in a natural setting. At Vida Verde, we believe that comprehensible input is best imparted through complete immersion. That is why we have designed our courses to give you a complete immersion experience. You will be constantly surrounded by Spanish: from breakfast with your host family, to hours of Spanish class, to cultural activities led by a native teacher in the afternoon. The goal is to give the students the nuts and bolts of Spanish grammar, then getting them to use it in real life situations! If you faithfully speak only Spanish during a month long stay with us, you may even start dreaming in Spanish! 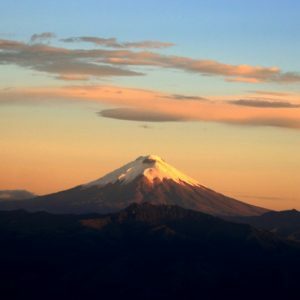 Cotopaxi is an international symbol of Quito and one of the tallest volcanoes in the world. It towers to a height of 5,897 meters (19,347 feet) and draws thousands of hikers from all over the world. The combination of thinning air, steep climbs, and snow covered paths makes Cotopaxi an impressive challenge. Because of the length and altitude of the journey, hikers require two days to reach the summit. If a hiker gets impatient and attempts to rush the journey up Cotopaxi, they will inevitably be taking an emergency helicopter down. The same is true for learning Spanish. Too often students try to force more Spanish into their brains than they are ready for. They think that if they do more grammar exercises or try harder, they will learn quickly. Unfortunately, this usually leads to disappointment. The best advice we have is to take a breath and enjoy the process. Learning a new language takes time. Our final piece of advice is to find a good teacher. It´s no secret that not all teachers are created equal, and in the education world, it is generally accepted that the quality of the teacher is the number one factor in success of the student. Find a teacher with whom you feel comfortable and who knows their Spanish. For this reason, Vida Verde makes sure to hire only the best teachers. Check out this link to find out more about Vida Verde´s teachers.